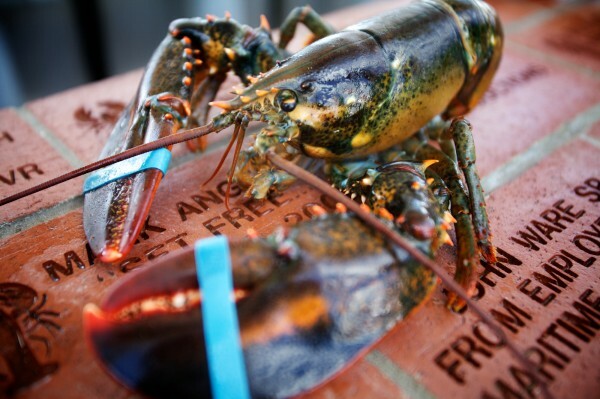 A lobster bound for the table at the 65th annual Maine Lobster Festival in Rockland on Wednesday August 1, 2012. ELLSWORTH, Maine — Pesticides have long been considered a menace by Maine’s lobster industry, and now a Deer Isle lawmaker is proposing legislative help in keeping some of the chemicals away from the state’s top commercial fishery. Walter Kumiega has introduced a bill that would ban the use of two pesticides commonly used to kill mosquitos. Kumiega’s bill, LD 1678, specifically would not allow the use of methoprene or resmethrin in any body of water that drains into the Gulf of Maine or on land where runoff into the ocean is possible. According to a press release from the House Democrats, the two pesticides were found in the tissue of dead lobsters that turned up in Long Island Sound in the 1990s. Many have blamed the use of mosquito pesticides in the metro New York City area for contributing to the collapse of the fishery in the waters off Connecticut and New York. Increasing water temperatures, low oxygen levels and other chemicals also have been blamed for the widespread lobster deaths in the sound. Maine’s lobster industry accounted for $340 million, or 65 percent, of the $527 million total dockside value of all commercial fishery landings in Maine in 2012, according to statistics compiled by the Maine Department of Marine Resources. House Democrats said in the release that lobster caught in Maine accounts for more than 75 percent of the nationwide catch and is estimated to generate as much as $1.7 billion for the state’s economy each year. Contacted Thursday by phone, Kumiega said he’s been told that the two chemicals currently are used sparsely, if at all, in Maine. He said he is not sure if anyone might be strongly opposed to banning the use of the pesticides. The Legislature’s Agriculture, Conservation and Forestry committee is expected to hold a public hearing on the bill at 1 p.m. Thursday, Feb. 6, in Augusta. There have been some high-profile cases in which companies that have applied pesticides have been held responsible for the subsequent deaths of lobsters. In the mid-2000s, three chemical companies reached multimillion-dollar settlements with Long Island Sound lobstermen who blamed the usage of pesticides for the late 1990s die-off in the sound. The Lobster Institute at the University of Maine, which investigated the die-off and supported the fishermen’s claims, received $100,000 as a result of one of those settlements. Last year, a Canadian aquaculture firm was ordered to pay several hundred thousand dollars in fines and penalties after it pleaded guilty to using illegal pesticides that were found on lobsters that turned up dead in Passamaquoddy Bay, not far from the Maine border. A subsidiary of New Brunswick-based Cooke Aquaculture, which is the largest fish aquaculture firm operating in Maine, was accused of using cypermethrin to treat an outbreak of parasitic sea lice in the company’s salmon pens. Cypermethrin is banned in Canada but can be used in Maine with advance approval from state officials. The cases in Connecticut and New Brunswick have not gone unnoticed by Maine lobstermen. Some offshore island communities, where lobstermen make up a sizeable portion of the year-round populations, have openly opposed the use of pesticides because of concerns about their possible effect on lobsters.